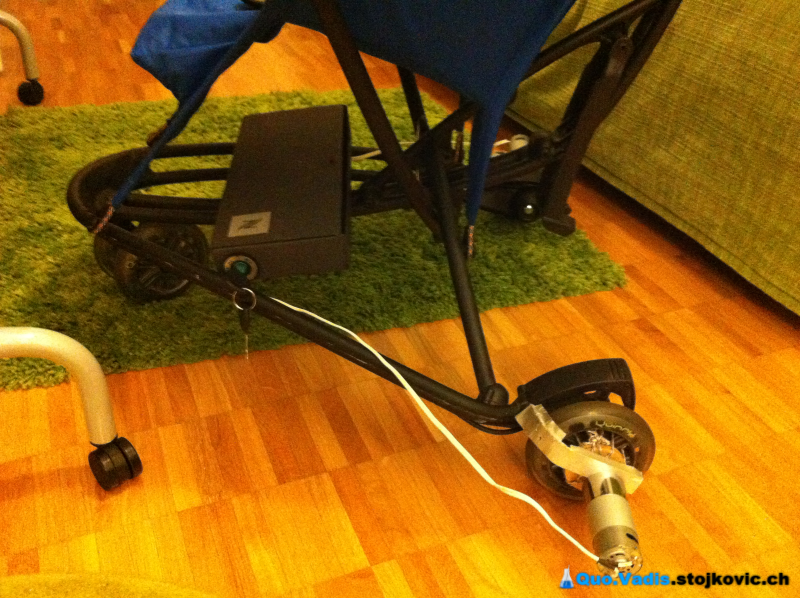 Elektro Pioneer – remotely controlled motorized baby stroller – Quo Vadis ? The first thing I did was to determine the necessary power needed for driving the stroller. In order to this so, I conducted a small experiment: I put my son in the stroller, and used the hand baggage scale to measure the force needed to drive the stroller. I did the experiment on different types of the ground. Using basic physics, I have calculated that the minimum torque of 10 Nm is needed to drive the stroller. I decided to use two motors, each one giving power to one back wheel. Note: In this step I had made a mistake, which I realized at the later stage of the project and growing up of my son. I will refer to this later in this post. In order to transfer the power from the motors to the wheels I have constructed wooden gears based on the calculated transmission ratio. I used my elementary school skills with plywood and saw and was really happy with the result. As a final touch I painted the gears and applied some light lubrication in order to reduce the resistance and the loss of power due to the transmission. One pair of the gears had been mounted directly to the wheels; the second pair of the gears directly to the motors. In order to keep all this tight and together, I used the custom made frame that was fixed to the stroller. On the same frame I fixed the motors as well. 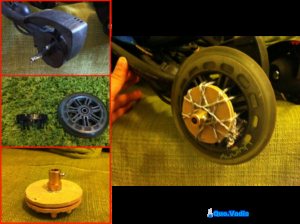 With the gear ratio 1:2 and the wheel diameter of 15 cm, in order to achieve the normal walking speed of ~3 km/h I had to use motors that had 200 rpm. Based on the requirements (total torque of 10 Nm and rotation speed of 200 rpm) I found and ordered two 12V DC gear motors with integrated gearbox that had those characteristics. In order to properly drive the motors, I used Dual H Bridge DC motor driver (L298N). 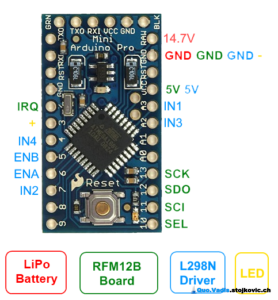 This driver provides enough current to drive both motors in both directions. For controlling the motors I used Arduino Pro Mini. By providing variable PMW signals to 2 driver inputs, I was able to control the speed of the motors and the direction of the wheels rotation. 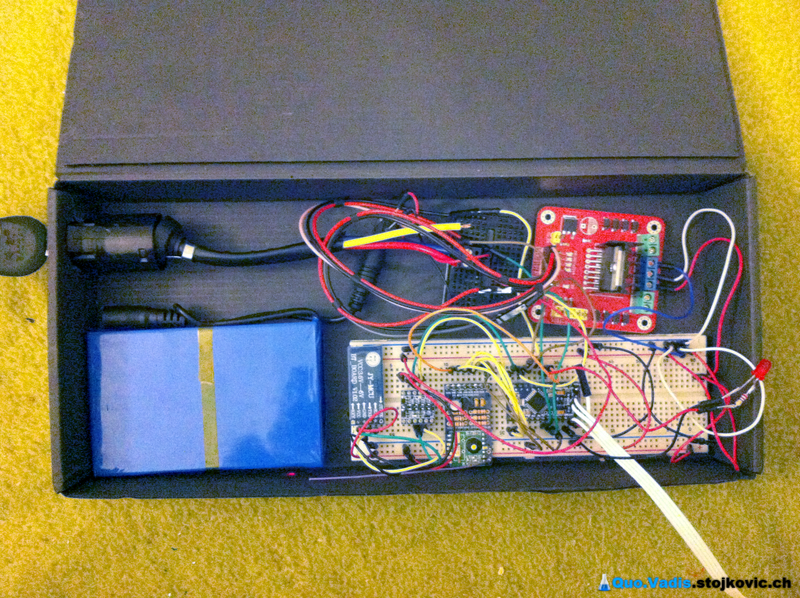 Since the whole setup had to be mobile, I used 20Ah LiPo battery that provided 12V DC power to the whole system. 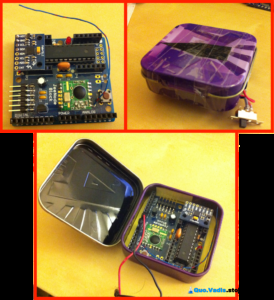 The motor driver was powered directly from the battery, and I used Arduino’s on-board power regulator to power it. Initially the idea was to use a joystick to drive the stroller; soon after playing some RC Plane simulator on my phone I have decided to do the steering in a much user friendlier way – using a remote controller with a gyroscope! On the stroller part of the setup, I connected RFM12B as a receiver and on remote controller part JeeNode (Block) with MPU6050 gyroscope and RFM12B as a transmitter. Information about the remote controller position has been calculated and sent every 200 ms from the remote controller to the stroller. Surprisingly, this gave really natural feeling of the controlling the stroller, almost like in video games 🙂 With the “safety” feature described bellow, this was definitely a nice touch to the whole setup. The electric diagrams of the stroller and the remote controller parts are shown on the schemes bellow. Once all was put together, the whole family headed for a nearby playground to give the new toy a maiden ride. First we have tested only the steering, electronics, motors and gears. The test was OK.
Then we went on with the empty stroller. The test was OK. Although everything was working as intended, once we put a child in the stroller, it failed to move 🙁 After spending some time debugging the whole thing, it hit me: the motors were not giving enough torque to move the stroller with the kid inside. Kids at this age (1st year) have a strange tendency to gain their weight rapidly; my son gained additional kilograms from the moment I did the initial calculation, and the motor power was simply not enough. I have disassembled the whole thing and went back to the lab / home. In meanwhile we bought a much lighter and smaller stroller. 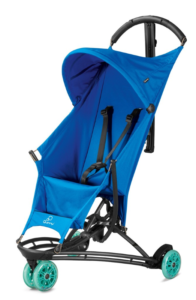 It was a super light stroller from Quinny, which at this point I would highly recommend to the all parents to be. A good thing was that I could just use the existing electronics and the motors; a bad thing was that I had to throw away the self-made gears. Luckily for me, the wheel diameter of the new strollers was half of the diameter of the “old” stroller, and by fitting the motors directly to the gears, I didn’t need to change anything else. I noticed that the new setup was more powerful and more agile then the previous one. This was due to the overall smaller weight of the stroller with the child in addition to no power loss in the wooden self-made gearbox. 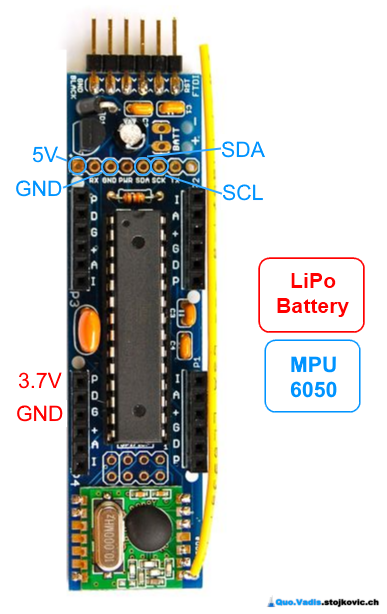 Some battery monitoring mechanism – I didn’t dig deeper in investigating power consumption. © 2015 – 2017, Quo Vadis ?. All rights reserved. What motor did you use ? Took me some time to take the picture. What an awesome idea and implementation !